I’ve found both forms on the Sarcidano plateau, a central region of Sardinia. 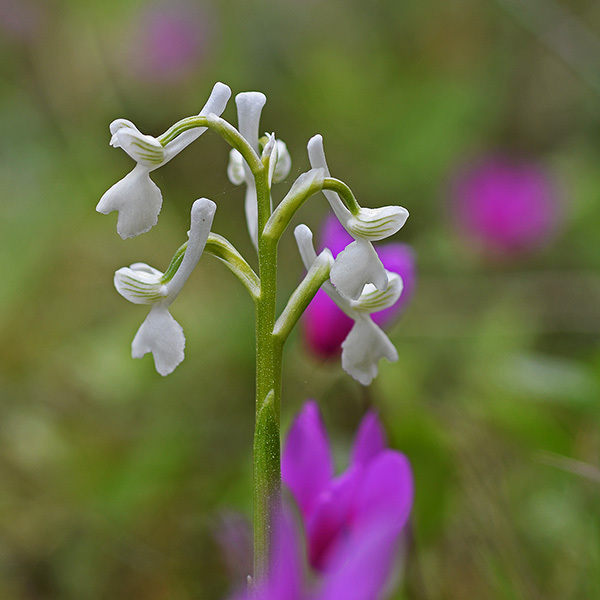 Much more frequently are the white-flowered forms of Anacamptis morio subsp. longicornu in Sarcidano. 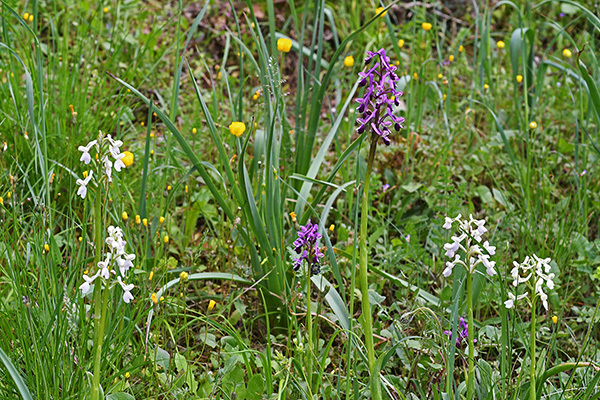 Respectively one third of the overall several thousand plants in this region has the dark violet colouring, a bright violet (or rose) colouring or are white-flowered. You can’t find this accumulation of albiflora forms in other regions on Sardinia which I’ve visited, neither at Domusnovas/Iglesias nor in the North or at Monte Albo. There, Anacamptis morio subsp. longicornu are consistently flowered in the regular violet. The albiflora forms of Sarcidano possibly have an evolutionary advantage. In this region there are also many Orchis mascula subsp. ichnusae giving pollinators as bees the learning experience that there is no nectar in the spur at flowers with this colour and form. 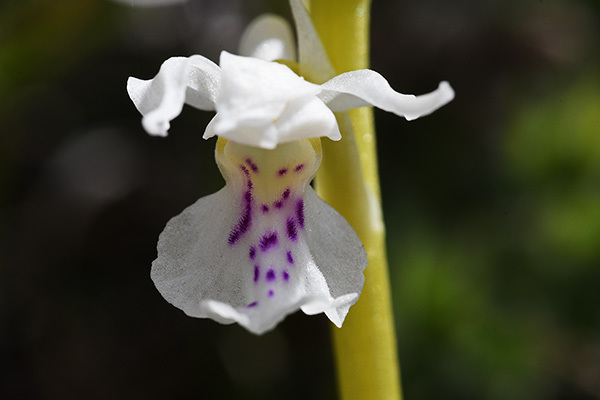 In the other regions Orchis mascula subsp. ichnusae was less common or not present. 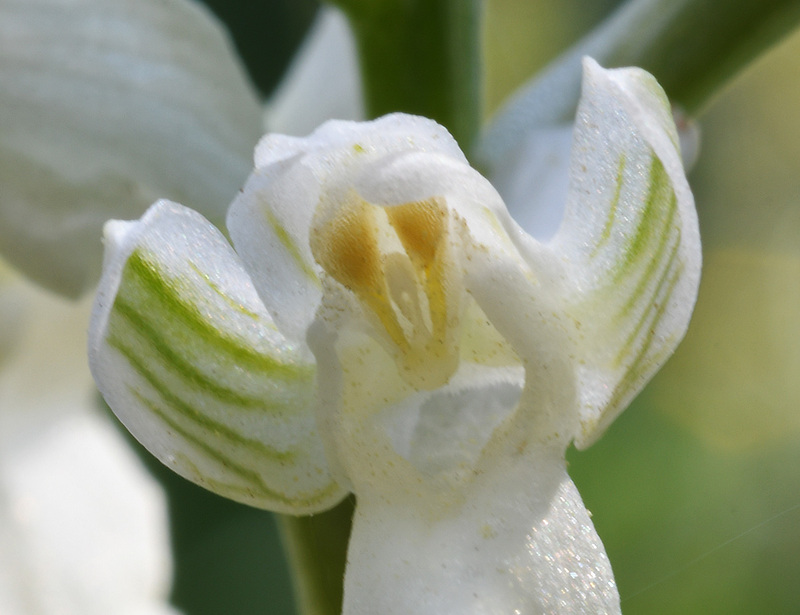 … develop white flowers while their species is supposed to have coloured flowers. This Gentiana germanica, found at Seiser Alm in the Dolomite Alps, is an example. The plant at the right side has flowers without pigments (anthocyanins). It may be viewed as “Gentiana germanica albiflora”, as Ferdinand Schur has noted in his article “Beitraege zur Flora von Wien” (Oesterreichische Botanische Zeitschrift vol. 11/1860). 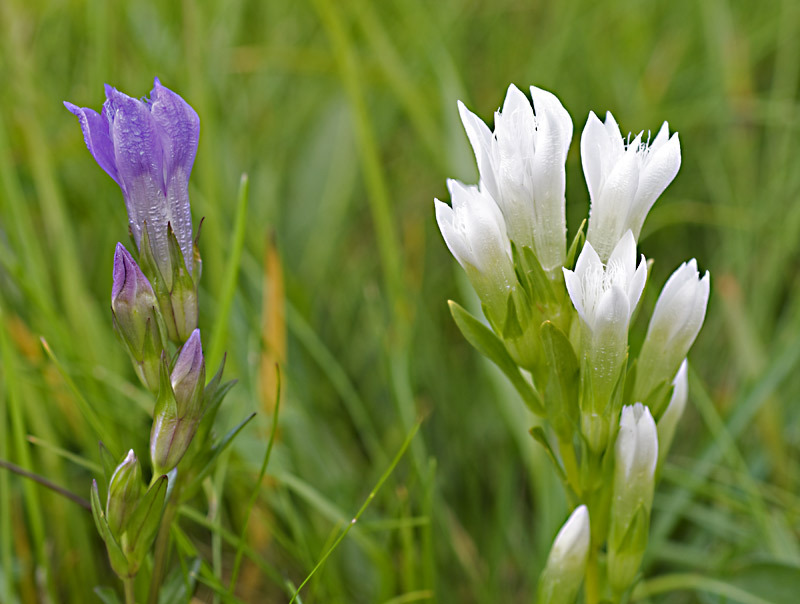 The correct name should be Gentiana germanica f. albiflora. Another example found this year in the Swiss region of Aargau is Ajuga reptans f. albiflora which has acquired some horticultural importance. 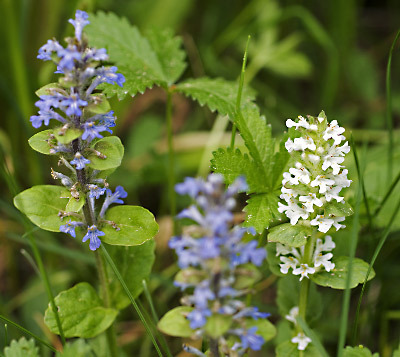 But neither the Gentianaceae nor the Labiatae (the family of the genus Ajuga) could be viewed as a family with a certain tendency towards developing white flowers – as it is the case with orchids. Maybe another family with an albiflora disposition are the Cactaceae. 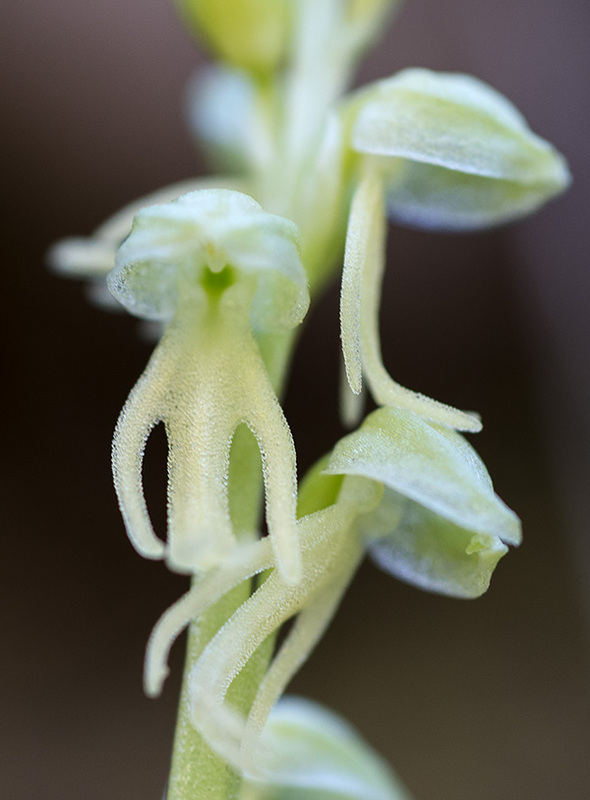 A charming web gallery of albiflora cacti has been set up by Gerd Weiss presenting more than 50 species. 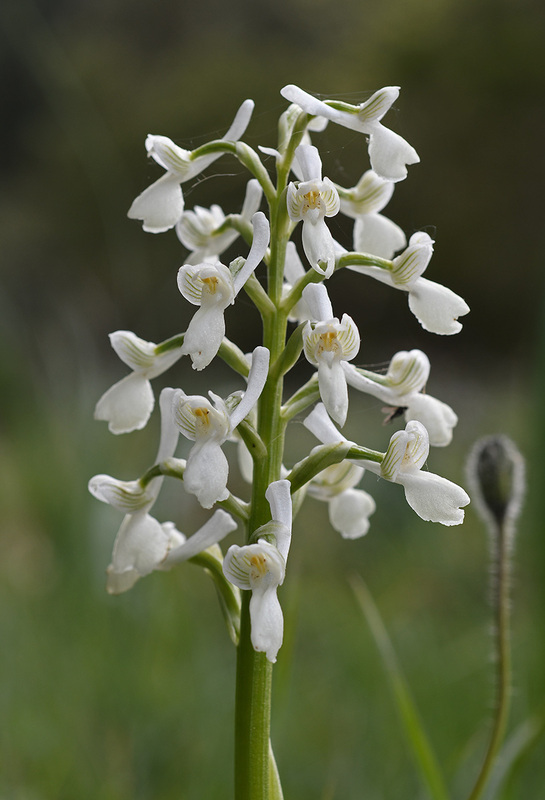 Most white flowering orchids have a last hint of colour in its petals, its spur or ovary. In these cases, the ability to produce pigments is clearly reduced, but obviously not totally suppressed. 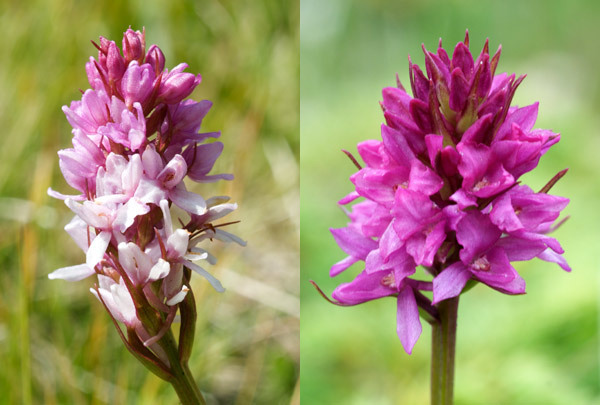 Studying albiflora species of Gymnadenia odoratissima in the Dolomite Alps, some plants show a rest of rose colour (left) while others still have a violet hue (right) – especially visible in the buds and in the ovary. 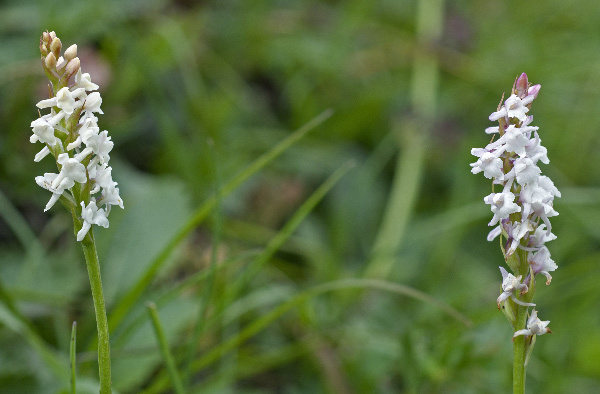 At the slope of a meadows near the Schlern mountain there are about ten plants of Gymnadenia odoratissima with more or less white flowers. It seems that there are different pigmets suppressed in both cases. Only plants with all colour pigments suppressed have totally white flowers. That is also clearly visible with Gymnadenia conopsea at the Puflatsch alm of the Dolomite alps. The Puflatsch Alm above the alpine village Siusi is famous for its colour varietes of Nigritella nigra ssp. rhellicani. As part of a field trip in the Dolomite Alps I had the chance to explore this region with an altitude of 1990 to 2150 metres for four days. Especially rich is the flora in the surroundings of the Arnica Huette, where thousands of Nigritella and Gymnadenia conopsea are flowering in mid July. 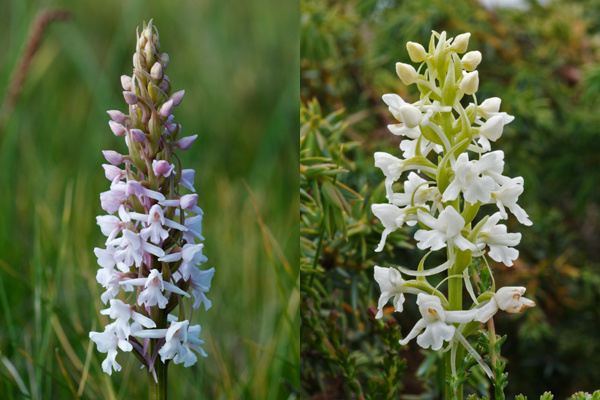 Additional orchid species are Pseudorchis albida and – in depressed areas – Dactylorhiza majalis. Among the flowering Nigritella colour varietes are quite common, even though I couldn’t find a totally white one. All the pale-yellow or white flowering plants still had single flowers with a slight rose hue on the edges of the lip. 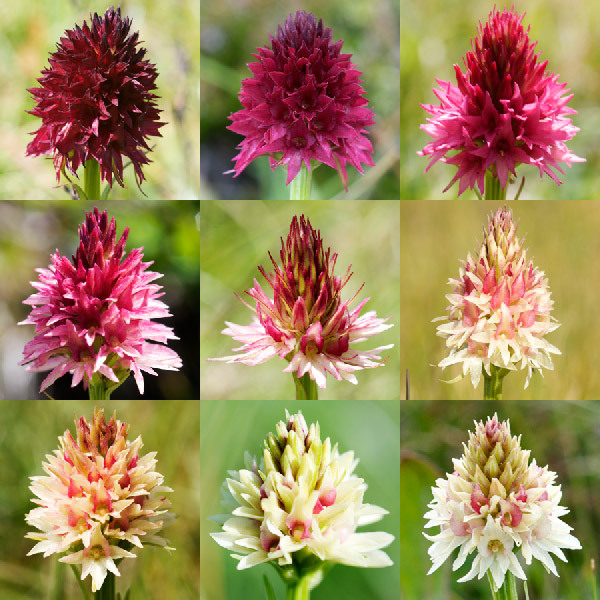 The most common colour variety is an inflorescence with light red flowers in the upper and pale flowers in the lower part.